Our guest is Vinney Chopra. Thanks for being on the show again, Vinney. Thank you. It’s always a pleasure. I appreciate Vinney being on the show. He’s such an expert in this space. He’s got more experience than probably anybody that I know in this business. Vinney has been on a few times. I’m sure you’re familiar with his name. He was on the show WS161 and he was also the first guest, WS01. Thanks, Vinney, for being back. We’re going to do a series of shows with Vinney, diving in a little more in-depth about some specific topics. Vinney came to the US with $7 in his pocket and now he has over 35 years of real estate experience and fifteen-plus years in multifamily syndication investing, managing experience, including overseeing management of $220 million in real estate assets. Vinney, thank you again for being on the show. Thank you, Whitney. What a great show you have. I appreciate that. Your show name is so appropriate, syndication show. My job and yours is to let everybody cast that vision, how great that a special thing is when you get other people’s money involved and scale up faster, a lot faster than just buying a duplex and a fourplex and sixplex. Vinney, we want to narrow in on building our team. We’ll elaborate on what that team looks like. Once you to speak to the ones that are just getting started, I know you’re coaching many students also and I know you’re used to helping people get started at building a team. Initially, it’s like, “Where do I even start? Who would I need first?” The chicken and the egg thing, “Which team member is the most important?” Get us started in this building our team and let’s dive in. Real Estate Team: Look for a like-minded person with integrity, trustworthiness, and goals. You need to look for your circle of influence. As if somebody is starting right away, I try to tell my students also, “Please look for a like-minded person with integrity, with trustworthiness, with their goals, where they’re going at a local group meetup group.” The thing is you need to look in your circle of influence. I call it circle of influence, Whitney, because we have so many associates we have worked with in the past. We have relatives, we have friends, we have all these people. One needs to make a list of them and put down their qualities right next to it because you are looking for a partner who’s going to release, go side by side with you to build this business together. One team member that we all need is a partner. It’s not a solo game. Please do not try to do it by yourself because you will get discouraged. I know for sure because we were discouraged for almost ten months. We could not buy any property. Nobody wanted to give us loan. Nobody wanted to talk to us. We started from zero investor and they wanted to ask us how much experience we have. We couldn’t lie but we said we are learning it, and that’s how we are now successful. The big thing I would like to say is get a team member together, make a Wyoming LLC, get a business card, get a nice website, $40 to $50. People are able to make great websites for you. You’ve got to have a social media presence. Once we have that team member, total integrity-wise, there has to be responsibilities. You’ve got to lay out a foundation of the operating agreement and all the legal structure. Don’t try to copy and paste things. I don’t believe in that. It’s good to do LegalZoom, which is a very efficient service, very inexpensive that you could do that or even self-formation of the Wyoming LLC. I’ve talked to so many attorneys, Wyoming LLCs are just like Las Vegas LLCs and Delaware LLCs, but they are much better. The other part is we’re going to talk about a syndication attorney. That’s one person in our team because we are going to be raising money. When we raise money, we have to follow the laws of SEC ruling, Securities and Exchange Commission ruling. I would highly recommend, anybody could find a lot of different people, but Gene Trowbridge and Kim Taylor, they have been with me for 26 syndications that I’ve done 27th one now and they are marvelous people. Kim Taylor is right from Florida and Idaho. There are a lot of other great syndication attorneys. Please go on their website and learn and read what should a new investor look for? For the legal terms and how they have to not talk about advertising and how they need to have the preexisting relationships because most of the new investors will be doing mom and pop syndication Regulation D, which is exemption with 506(b) where you can get up to 35 sophisticated investors and as many accredited investors as you need. No problem. The thing is you want to become a student of this profession. You can’t just start overnight success. You’ve got to have a member in the team. You’ve got to get your syndication attorney. Just to put a little plug for my friend, I don’t get paid any money, Kim Taylor has a great service where she gives so many interviews for free, for only $1,000 or $1,500. Then she credits that back for the first syndication. You learn everything for free. It’s amazing. She’s been marvelous to work with. That’s one thing. My real estate attorney is another person we need in a team. Real estate attorney is good to have in the state you’re going to purchase the property. In my academy, I talk about you’ve got the team going, you’ve got the business, you’ve got the investor packet. The big thing is which stage you’re going to be buying the property. You’ve got to find the emerging market. I teach that there are three merging markets at least, three different states maybe, three different cities because you never know where the property is going to show up. You could have three or four emerging markets at one time and build relationships, get a syndication attorney which they could write in everywhere in the USA. The real estate attorney should be from that state because they will be the ones who will be involved in any contracts, any due diligence if it’s needed, any kind of litigation and other things like that. I don’t hear too many people talk about that, Vinney. They got in the syndication business having a syndication attorney and then having another attorney in that state. The syndication attorney is going to be the one to develop the PPMs and those documents around the syndication specifically, correct? The other attorney is going to know more state-specific laws for other contracts that you’re going to have or more specific questions for that state. Is that accurate? Exactly. I’m so proud to say thank you to my friend, Milton Colegrove, who is known us for about a few years. He oversees all my businesses, everything. He’s a very good counsel and you need one. You need a good real estate attorney. 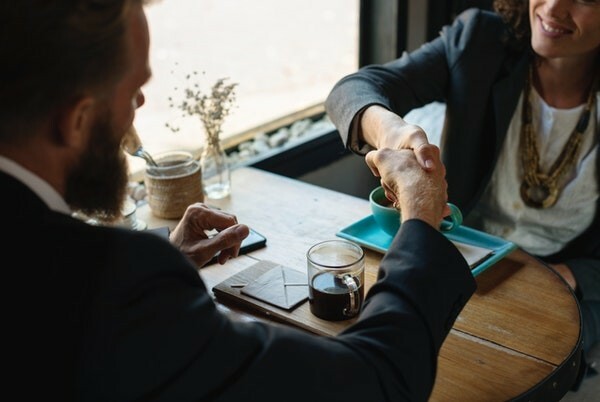 Syndication attorneys are great for PPMs but real estate attorneys are great for all the contracting, all the different purchase and sale contract we call it but looking through and giving opinions on other stuff related to the real estate. That’s a big one. Then the third one, a team member we need to have that would be a very big one are the brokers. You’ve got to bring some good, savvy brokers into your team, into your confidence as you find three markets you want to then go into. I teach that there are different ways to get all these brokers. 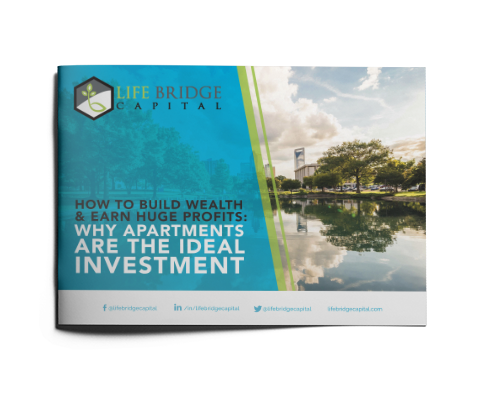 Most of the multifamily companies like ARA, Cushman & Wakefield, Marcus & Millichap, the boutique companies, I love doing business with boutique companies because they are a little bit smaller, but they do a lot of business in that given area. The very best way to find that to your audience, just Google and say, “I want to buy multifamily brokers in Houston,” for example. By just googling it, it’s going to come with all the different links. Just go one by one, go over there and try to not go to the top people in Marcus & Millichap. They will not give you time of the day. Who do the grunt work are the associates. You want to build relationship with the associates, not with the top people who don’t do anything. I’m sorry, they do something but their name is on the operating memorandum, but they are at the high level. Most of sellers are dealing with the associates at the lower level because they are the ones getting their P&Ls, rent rolls, all of the data, putting it together, graphics, this and that. They can get you the name of the property before anybody else will. Real Estate Team: People like to be bragged on. If you are giving them some good information, they would love to endear with you, and you’ll rise up. That’s the broker who is a very important part of our business and good brokers. Then I teach that we’ve got to be talking to them, texting to them, calling them, emailing them every ten days. We’ve got to be in touch with them, sending articles, look for their accomplishments. People like to be bragged on. If we are giving them some good information, they would love to endear with you and you’ll rise up. When a new person joins a company or starts asking for deals, pocket listing, they will not get pocket listings. We’ve got to get our space made with them. We’ve got to make sure that we scratch more. The scratch gets more warmth in it. The thing I say is the squeakiest wheel gets the grease. That’s the other part because if you just talk to them and just email them and not follow up, they are not going to remember you. You want to move from the fifth level to the top level in their book so that when they get a listing, they are now sending it to you also right there. That has been my secret. I’ve not done too many campaigns of letter writing or texting to the out-of-state owners or anything like that. I just have great relationships with my brokers. I use my iPhone as the best tool. You can text people, copy paste, I do that all the time. When I’m going to Atlanta, I draft a text message, nice one, put my picture. Always text with a picture, never text by itself. You’ve got to text some motivational quote with a picture on it and things like that. Those are small things but very big things in their mind. They look at texts but if they see the text and a picture, it’s going to remind them right away, “That was Vinney, he smiled. He’s a nice guy.” That is a big thing. The other thing is I’m huge in getting that euphoria going. What does that mean? I tell my brokers, “Vinney is coming into town.” I send them about a week before all these texts, the same texts copied and pasted to fifteen brokers. They don’t know who else is going to show me properties. All fifteen brokers are ready to get their listings going to meet with Vinney and talk to me and so forth. I love that. That is a very special team member. Other team member we need is a loan broker. A really good loan broker needed in commercial properties and who can write loans in many states, that’s the other part. You don’t want a local person somewhere in Massachusetts who has done maybe few loans, but you need to go to Texas. If you’re going to buy something in Texas, then you go to Texas and find a great loan broker. I would love to sell LMI capital. Brandon Brown is a great guy. Old Capital in the Dallas area is doing a great job. Michael Becker, I have never met him. I love to promote him because he’s a great guy and everything and they are doing good loans there all that stuff. A loan broker is very important also because they need to understand you as a new buyer what’s your net worth? What are your financial statements? What’s your experience? What’s your story? They need to package you in a beautiful package to show it to their local banks. I would love to not to brag about me but thirteen banks, he gave my properties to where I was needing renovation dollars and other things like that. Out of that thirteen, twelve wanted to give me loans. I never met nobody. He was doing all the work for me. I love those loan brokers. They make 1% commission or points, which is great. It’s amazing because they will do so much for you, get you the best rates. I don’t know if a lot of your audience knows that in the loan brokerage also, you could buy the same loan with different differentials they call it. You could add three years, five years, seven years and a prepayment penalty, no prepayment penalty. IO for one year, two years, three years, all these things. Loan brokers also get some money from the lender too, the banks and the other institutions. You can set up a good thing with them. Brandon has done all my loans. My first loan with him was only 0.5% points and that was amazing because I was able to do Fannie Mae loan quickly and so forth. I would highly recommend don’t go out and put LOIs all over the place. A lot of coaches are teaching that. That’s wrong because you’ve got to make sure what you can qualify for. How many units you can qualify with your net worth and the net worth of your partner or maybe third, we call it as the lone sponsor. Have all those three networks together, that is equal to loan because the loan amount has to be lower than the total net worth of the key principles. That is very important. The other part is loan brokers should be in confidence as we are talking to the seller on a pocket listing or the broker. We need to give them also the financials right away. We’ve got to give them right away because they need to underwrite that same property that I’m going to put LOI within 24 to 48 hours. I get these people going right away. My insurance agent, I send them the listing or pocket listing or address and they go on Google Maps, search to see how many buildings are there and they give me the real number for my insurance. We go to Assessor’s Office, my team member goes there. They look at this price, this is the total tax because that’s a huge number in the underwriting. The third thing is loan. If I cannot qualify for a loan, then why put an LOI? I believe in all those things. That’s what I would like to highly recommend your audience to get to the real reality as to what they can afford. Then don’t waste the time of brokers if you are not able to afford it. I have closed on all 26 of my acquisitions in the last few years. Twelve of them in the new company, I don’t know if you knew that, but they came in two years and two months. I did twelve syndications with my new company because I was flying by myself. I had experience already but as a CEO, I can make so many decisions and I don’t have to ask a partner. Newbies, they need to get a partner to get that first deal going or second deal going. You don’t need to stay partners for life. That’s what another I would like to mention. Please do not sign long-term contracts with your partners. That is not the way to do it. You’ve got to do with the partners. They need you, you need them. Once you get your first or second property, your net worth increases. Mine has gone up by seven times in such a short period of time. It’s ridiculous because syndication world is such a business where you scale up so fast. Once you start underwriting good deals and you give your investors, those are our partners that’s a very big one. The investors are huge partners. If they are not there, we are zero. I appreciate you talking about the partnership and how don’t sign a long-term commitment. Would you even say think of it like deal-specific especially initially? Do not make this big company together where you’re going to buy all these properties let’s take a trial run here on this property. After you’ve partnered with somebody, a lot of things are going to come to the surface that you didn’t know about this individual, whether it’s them personally or whether it’s their skills or their ability. It may even be better than you thought but it could be worse also. It’s good to have your own LLC, their own LLC, and that both LLC can come into that deal specific. We call this the property LLC and then a manager LLC on the top, which doesn’t cost that much money at all. In that manager LLC, you come in two partners plus the loan sponsor, if that’s the third person. Maybe if some people are raising money, they can legally come in there also in that manager LLC. It’s a very good structure to do it. I hope a lot of your audience will do that. That’s how I was taught by Gene Trowbridge. I like to go to the right way to do things, which we should all. Somebody like a loan broker, I feel like he’s not going to take somebody serious that’s never done a deal or has no team already somewhat established. 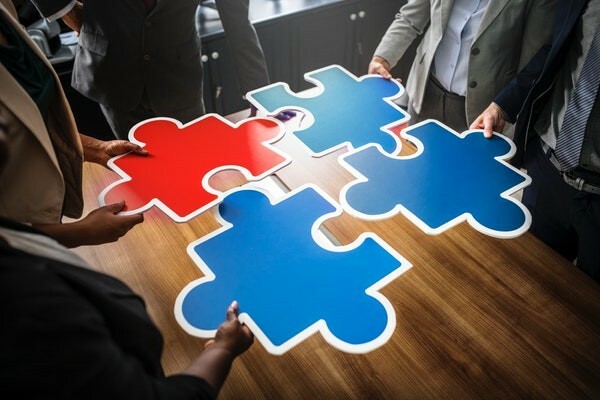 Just like going through the list of team members, if you already have these people in place, by the time you get to a loan broker, you’ve got a nice pamphlet or something. I hope at that time to be able to show him your company or show him that you’re serious about making this happen. Real Estate Team: The syndication world is a business where you scale up so fast. I’m so glad you’re saying that. I call it your big business card. It’s a credibility kit I call it in my language. Credibility kit for the brokers, credibility kit for the loan broker, credibility kit for investors, credibility kit for the attorneys. What that is, it’s your business plan. It’s what you are made of, your experiences, your bio-data and where you are learning. Who is your coach? Who is your mentor? What have they done? What seminars have you been to? People don’t know nothing, so you’ve got to put the best foot forward in showing everybody in a professional way. I hate to see some investors don’t want to invest any money. You could get a Fiverr.com person and pay $10. To let your audience know, I spent $10,000 to make this beautiful document, which is my educational brochure for investors. I showed that to my brokers and other people too. It costs me $10,000 because I wanted to do it right graphically and everything and diagrams and this and that. I give it for free to my students in a PowerPoint. They pay $50 and now they got a $10,000 instrument made for them for $50. I let them change the colors and everything and different graphics. It’s a brand-new piece, much different than Vinney Chopra and I love that. That gives them something to obviously show to these people that they’re serious. I feel like too, when you’re new, like a lot of the listeners are, they’re trying to get started in this business. You’re nervous about those conversations. Having something like that in front of you gives you something. You can read some of the stuff off of it but then also it gives you a blueprint to walk through a little bit when you’re talking to this professional that you’ve never met before, and maybe you’re a little bit intimidated. It’s helpful to have something to hold in your hand that you can read a little bit from and not have to come up with all of this from memory. Let’s talk about one more partner, a team member we need. Everybody who is starting out is the property management company. They are a good solid team member that we need. If anybody would like to ask for questions and everything like that, I have a very big Excel worksheet that we put together in questions. Your audience can just text the word, LEARN, to 474747. We can get that for them. The thing is property management company also. You’ve got to look at what you can afford, which level of units. If it’s 15 units to 50 units, you should only look for the property management company that specializes in that particular segment. If you’re looking for 100 units or 200 units, then you go for the more sophisticated property management company. That is a must because the lender, the bank, Fannie Mae &Freddie Mac, small business, local banks, will not give you a loan unless they have a complete confidence in your ability that you have the experience to manage the asset after closing. If you don’t have the asset management experience, they will not give you the loan. You need a third party at that time in the starting just like we did. We used a very nice company from Dallas, Texas and then we started our own two companies. That’s important. That’s another team member. Then we talk about the last team member. I covered probably a whole spectrum in team members right there. The other team members we need are the investors. If they are not there, we are nothing. They are the ones who are going to invest their money from retirement. $26 trillion is in retirement accounts right now. We’re going to go in-depth about investors in another episode. We sure will big time. I wanted to make sure the listeners knew too that you had mentioned about the property management and the list of questions that you would provide. You said to text, LEARN, to 474747. Is that right? Yes, LEARN to 474747 then reach my academy, my team member’s mastermind. I’m group coaching, master coaching because I can’t have time individually. Many students want to learn and I appreciate that fact. Please, send that word, LEARN, to 474747. Vinney, thank you so much for your time and being on the show and breaking down the team members that we need and why we need them. Also helping those that are brand new to the industry and get started and what they need to get those conversations going to build this team that we have to have that’s a must. Thank you, Whitney. God bless you. I hope the audience will join Vinney or text, LEARN, to 474747 or they could also go to Lifebridge Capital and connect with me. 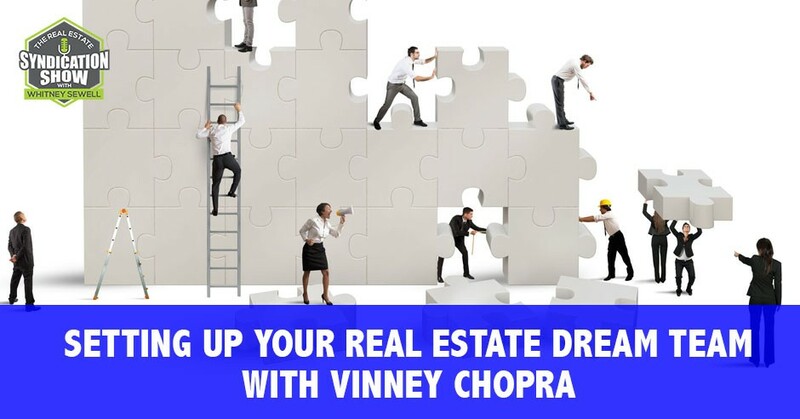 They can also go to our Facebook group, The Real Estate Syndication Show, where we can all learn and grow our businesses together and learn from experts like Vinney. Have a great day. With a bachelor’s degree in mechanical engineering, he entered The George Washington University to seek a master of business administration degree in marketing and advertising. He sold Bibles and educational books door-to-door to support his studies, excelling both in the classroom and outside because of his work ethic and overwhelmingly positive attitude. There’s a reason Vinney’s nickname is “Mr. Smiles,” which is evident even through just hearing the demeanor in his voice! He has always believed in individuals’ ability to shape the world around them through positive thought and selfless actions, and he has been a passionate motivational speaker and teacher for over three decades. After getting a taste of sales and marketing while pursuing his MBA, Vinney decided to leave engineering altogether and become a motivational speaker and fundraiser. He worked tirelessly to build a clientele that would work with him annually to raise the funds to meet their goals and dreams.